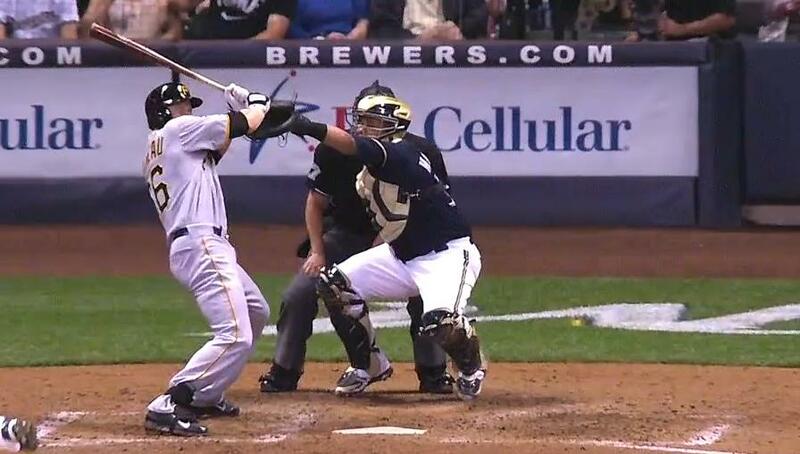 In the fifth inning in Milwaukee on Wednesday, Andrew McCutchen hit a home run to left. He didn’t get it all—it just cleared the fence—and he managed to lose it in the lights before he knew where it was ending up. As such, he loitered in the batter’s box to try and get a read on it. Peralta offered up the standard denial of intent, saying “Yeah, you know, it wasn’t on purpose,” before detailing how he missed his spot while trying to go up and in. “I know it looks bad, because right after a homer, you don’t want to hit people,” he said. Unless, of course, hitting people is exactly what you want to do. Morneau reacted angrily, and even though he never approached the mound, benches cleared. After the game, Pittsburgh’s first baseman wasn’t ready to level blame with any degree of certainty. Not to disagree too wholeheartedly with an experienced big leaguer or anything, but it seemed pretty intentional. Add the wrinkle that Morneau’s career was derailed and diminished by concussion-related symptoms, and the idea that Peralta came anywhere near his head in a misinformed fit of retaliation is unconscionable. That was the final meeting between the teams this season so any personal retribution will have to wait, but there are no such constraints on the commissioner’s office, which may opt to hand down some discipline of its own.